I recently got into a debate with a coworker about dark patterns. He's a numbers guy -- and I made the mistake of bringing up an example of a dark pattern for which I didn't have evidence of any negative consequences. Ads disguised as something else — like those banner ads back in the day (and sometimes even today) that looked like search boxes. These definitely increased conversion rates, but I didn't have evidence of what the harm was. 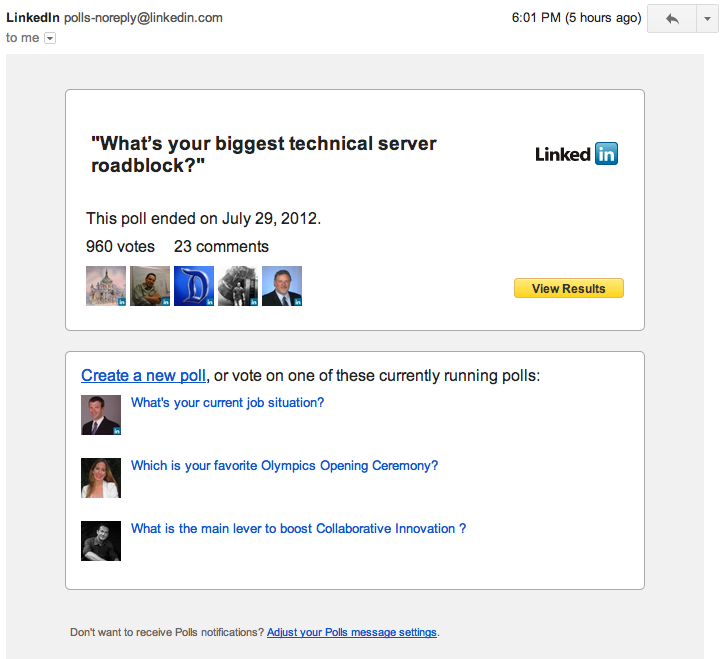 They could have displayed the survey results in the email, or at least the "winner". But instead, they just included a "View Results" button, so I'd actually have to visit the site to see the results. I know about Net Promoter Score and the idea that a detractor can undo the positive effects of six promoters, but that didn't convince him -- he suggested that the annoyed users may not be your target audience anyway. What evidence is there that the costs (annoyed users, lost time doing something positive, etc.) outweigh the benefits (increased conversion rates or "engagement rates")? Wow, nice and interesting question! Personally I would consider that this rather depends on a person's philosophy and is more or less a morality issue. If dark patterns could do harm (financially, whatever), I am not sure this could be measured in an explicit way. The examples you gave, e.g. misleading ads, could IMO be very different from emails that might (in some cases) not on purpose withhold information, whereas, of course you are right, in other cases it might be on purpose. how long can I use dark patterns till users get used to it, know me for it and will recognize what I try them to do? what will competitors think if they see me using such approaches? will or could they take action against me? If you really want to measure the difference in results, take those points into consideration, and also that tests for that might be accurate now, but look at the bigger picture as well, on long-term objectives. With subjects like this it's almost impossible to give a boolean answer. Let's take, for example, those ads you get on software sites that have 'Download' buttons in their design. Even to the trained eye they're hard to tell apart - dirty tactics well executed! Now if those ads take you to related software at a cost, and N user's purchase, the bad practice is actually good for business but bad for the user. The question you need to ask yourself is why does UX exist? What kind of company are you morally? If your jobs as a UX person at the company is to make users happy then dark patterns are bas for business. If it's your job to make lots of money for the company then I guess it's part of your role to use dark patterns to get that done. Personally I'd rather not work in that sort of environment, but I can't say I think it's BAD for business if business = making money. I'm not sure if it can be proved empirically that dark patterns are damaging to the business that employs them, especially taking into account that these patterns are likely only one of many examples of the company in question disrespecting the user (poor customer service, low quality products, etc.). My feeling is that, if the company lacks competition, they'll get away with it without much damage. Just yesterday, I checked in online with the low-cost airline, Ryanair; their site is full of bad UX design/dark patterns. But they are cheaper than the rest. I'm desperate to give my money to another company, but, for the moment, there's no other option. Not the answer you're looking for? Browse other questions tagged psychology conversion dark-patterns analytics nps or ask your own question. What's the difference between what's best for the user and that what the user is used to? Are there any case studies which provess that Re-design of existing Website helped to get more traffic and business significantly ?